Information on this page is for archival purposes only. It represents OUT-OF-DATE and probably irrelevant versions of documents. If you are interested in what is currently being proposed, DON’T BOTHER READING THIS. Current project information can be found on the 129 Parker Street Project page. In November 2013 the Board of Selectmen formed an ad hoc committee regarding the future of the 129 Parker Street project. The Committee completed its objectives on March 12, 2014. The findings and minutes of the committee are available below. For archival information on the committee please visit the committee page. 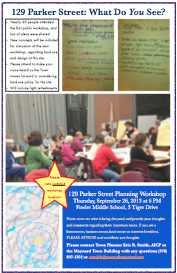 Two visioning sessions for the 129 Parker Street property were held on August 29th and September 26th, 2013. Read a memo with a summary of the workshops from facilitator Angus Jennings. It outlines the next steps in the 129 Parker Street Redevelopment Effort now that we have finished the two Visioning Workshops. The subject of this memo will be discussed at the 1-Oct-2013 Board of Selectmen meeting. You can download the slides from the August 29, 2013 Planning Workshop here or the workshop on September 26, 2013 here (they are also available in the Resources section below). Also available are the keypad polling results from the September 26th meeting. 17-Oct-2013: The Summary Report is intended to summarize the process, outcomes and recommended next steps toward arriving at an agreed plan for property reuse and redevelopment at 129 Parker Street . 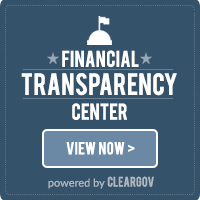 Download the Summary Report here. The former Digital Equipment Corporation complex at 129 Parker Street is being developed by Capital Group Properties under the working name “The Shoppes at Maynard Crossing”. This area is a repository of information about the project’s interactions with town government (various committees and departments). A Special Town Meeting was scheduled for Sunday, May 19th at 1pm in the Fowler School Auditorium. There are two articles presented at that Special Town Meeting. Article 1 was a proposed amendment to the Neighborhood Business Overlay District (NBOD) zoning by-law. Article 2 was the Concept Plan for the project. Both of these articles have been updated by the developer several times since the original warrant for the original (April 6th) Special Town Meeting was filed. Because these articles changed several times, comments, analyses, and meetings on them by and from various committees may represent reviews of prior versions of the articles. Please take this into account when using the resources here. Neither article was endorsed by Special Town Meeting. 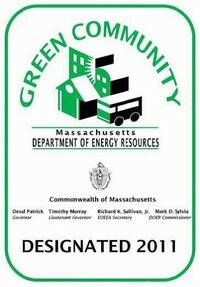 The following documents were relevant to discussions at Special Town Meeting, but they were not voted upon. Please use them to provide additional insight into the project’s impact on the town. Please feel free to use the Resources section below. It contains letters, reports and other materials related to the project that may help you further understand the articles: of particular note there is a Review of the two articles by the Collins Center which is very comprehensive. Again, please note that the articles have changed and many of the reports were responding to earlier draft articles. The 129 Parker Street Project was on the agenda for the 1-Apr meeting of the Board of Selectmen. The Planning Board also attended this meeting. The 129 Parker Street Ad Hoc Committee met on Jan 22nd. The 129 Parker Street Ad Hoc Committee met on Jan 15th. The 129 Parker Street Ad Hoc Committee met on Jan 8th where the public was invited to comment on two Concept Plans. The 129 Parker Street Ad Hoc Committee met on Dec 18th. The 129 Parker Street Ad Hoc Committee met on Dec 4th. The 129 Parker Street Ad Hoc Committee met on Nov 25th. The 129 Parker Street Ad Hoc Committee met on Nov 6th, 7pm at Town Hall. The next steps for the 129 Parker Street visioning process was on the agenda of the Board of Selectmen meeting on 1-Oct. The 129 Parker Street project and timeline was on the agenda of the Board of Selectmen for their 16-Jul meeting. The 129 Parker Street project was listed on the agenda of the Planning Board for their 11-Jun meeting. The Planning Board continued a hearing regarding the 129 Parker Street Project’s Zoning By-law Amendment on May 15th – 7pm at Town Hall. Discussions may include the Development Agreement (above). The Board of Selectmen joined the meeting at 8pm. An updated Article 1 (NBOD Zoning Bylaw Amendment) was published on April 16th and is available for review (see review copies of the articles above). The 129 Parker Street Project was listed as an agenda item for the special Board of Selectmen meeting on May 8th. The Conservation Commission is now posting site inspection and erosion control reports to this page. 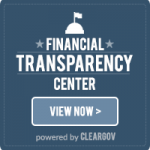 You can find the reports below the Resources section. The 129 Parker Street Project was listed on the agenda of the Conservation Commission meeting on May 7th. The 129 Parker Street Project was on the agenda of the Finance Committee for their May 6th meeting. The 129 Parker Street project was the subject of a public hearing (Request for Determination) by the Conservation Commission on Apr 23rd. The 129 Parker Street project was on the agenda of the Finance Committee for their April 22nd meeting. The Board of Selectmen met on April 9th at 7pm to discuss rescheduling the Special Town Meeting. A Special Town Meeting was held on April 6th to take up the zoning bylaw amendment and concept plan. The meeting was dissolved before taking a vote as the various boards felt that the recent changes did not have sufficient review. A new Special Town Meeting will be rescheduled. The Planning Board continued a hearing regarding the 129 Parker Street Project on April 4th. The 129 Parker Street Concept Plan was listed on the agenda of the Conservation Commission meeting on Apr 2nd. The developer provided an updated version of Article 2 (Concept Plan) on 1-Apr. The developer provided an updated version of Article 1 (NBOD Zoning Bylaw) on 29-Mar. The March 28th Planning Board Continued Hearing on the 129 Parker Street project was cancelled (a continued hearing is scheduled for April 4th). The 129 Parker Street property was on the agenda of the Board of Assessors meeting for March 26th. The 129 Parker Street project was on the agenda of the Finance Committee meetings for March 26th and April 1st. The 129 Parker Street project was the subject of three Planning Board Hearings on Mar 5th, Mar 27th and Mar 28th. [A previously announced hearing on March 7th was cancelled. The March 28th meeting was also cancelled.] Proposed revised article 1 for the Town Meeting warrant was submitted to the Planning Board and is relevant to these meetings. The proposed articles were published on the Town Meeting page. On 26-Mar this proposed article was superseded by updated articles from the developer. The 129 Parker Street project was on the agenda for the Finance Committee meeting on March 11th. The 129 Parker Street project was on the agenda of the Conservation Commission meeting on March 12th. The 129 Parker Street project was listed on the agenda for the Board of Assessors meeting on March 13th (please refer to the agenda for details). The 129 Parker Street project was on the agenda for the Board of Assessors meeting on Feb 6th, 6:30pm at Town Hall. Public comments on the 129 Parker Street Project were heard at the Board of Selectmen meeting on Feb 26th, 7pm, at Town Hall.